In another case of don’t judge a book by its cover—or title—The Gentry Man is one enormously pleasant surprise. Mr. Rubenstein introduces the reader to an entrepreneur and literato who had a decidedly different take on what it meant to be a man in the generation that came of age in the 1950s. The owner, founder, and gentleman in question here is William C. Segal who started Gentry men’s magazine in 1950 and shut it down in 1957 after a mere 22 issues. Today the magazine would flourish, as the concept of a contemporary man is considerably more evolved and accepting of Gentry’s forward design ethos and choice of relatively arcane topics for its articles..
We have all read about Fleur Cowles and her Flair, Diana Vreeland during her Vogue and Bazaar days, and even magazine mogul Condé Nast, but why is it that we have never read about William C. Segal? He was an amazingly prescient man who foresaw what an evolved and enlightened man in the 20th century would look like. In an age in which men were exemplified by Archie Bunkers and Ralph Cramdens, Segal reflected the likes of David Niven, The Duke of Windsor, and Douglas Fairbanks; in other words, he was a gentleman of class and eclecticism, foresight and a taste born of tradition mixed with futurethink. Segal’s men were cultured, intelligent, sartorially concerned and conscious, and well versed in all things contributing to a life lived to its fullest. One sees that there is such an amazing similarity between Segal and Mrs. Vreeland with her “Why Not?” The outrageousness, the humor, the fantastical prophecies, and over all worldliness has so much in common with Mrs. Vreeland and Ms. Cowles. Segal was perhaps the first who used a refined and yet relatable sense of humor and irony to reach out to his male audience, just as the women’s magazine editors did to reach their readership. For William Segal, there were no taboo subjects where men were concerned—and he tried to touch upon so many of them otherwise considered not “manly” enough. His distinct edge was that he owned the magazine and had no one to answer to; on the other, Gentry magazine lasted only 22 issues due to financial losses. He and his editors covered all the usual subjects like sports and cars, but they also always pushed the usual boundaries—for instance, including with the former subjects a piece on “how to watch” a particular sport, explaining its rules and parameters—covering also subjects such as manners, menus, and wardrobes, topics usually reserved for women’s publications. How many other magazines of any kind of during that era that included articles about Zen Buddhism, diamond shopping, and art appreciation—all with a masculine slant? Gentry was the precursor of Details, Esquire, and Gentleman’s Quarterly—but as with all visionary endeavors, timing is everything, and perhaps by narrowing the tenor of his magazine to reflect such a high level of good taste, Editor in Chief Segal was ahead of his time—by about 50 years. 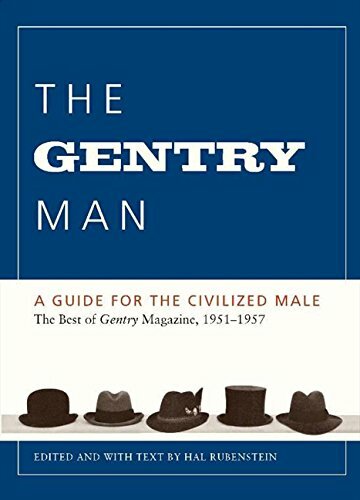 The Gentry Man: A Guide for the Civilized Male will delight anyone with even the slightest inclination to explore fashion history as well as readers interested in an outrageous and over the top man who, after the test of time, turned out to be much more brilliant than anyone might have expected. The books is also packed with reprints of uncannily themed articles demonstrating Segal’s prescience. The Gentry Man may take the reader back to a much simpler time when the world was more like “Ozzie and Harriet” and “Father Knows Best;” but even back then, when men were portrayed in the media mostly as either uneducated dolts or traditional dad types, there was ample space for progressive and enlightened males such as William Segal and the readers of his unusual magazine.